Get your podcast app ready, because we’ve got some serious recommendations that you won’t be able to download fast enough. While my commutes aren’t what they used to be (I used to spend 4+ hours on the road a day), I spend quite a lot of time driving and I love spending my commutes listening to inspiring content—podcasts or audiobooks. My favorite personal growth podcasts have changed since my last podcast post, so I thought I’d fill you in on my most recent favorites for intentional living from inspiring women. I’m into everything from boss babes chatting about owning a business of their dreams to women discussing life and love to interviews with inspiring people who are working to become their best selves. As someone who is always looking to improve, I love getting inspiration in my ear on the daily from women who are total go-getters. Below are my top ten favorite female-driven podcasts. Enjoy! Monica Welburn and Ella Gregory are twenty-something lifestyle bloggers with a passion for living their best lives. They have a lovely dynamic on the Let’s Discuss podcast, and share their personal views and tips on topics that everyone navigating their twenties is likely to connect with, like how to afford traveling, healthy habits, and the ugly quarter-life crisis. This podcast is one of the few that I kept up with each week and listened to as soon as they came up in the app. They unfortunately recently concluded season two (*sob*). Fun fact: We interviewed Monica for our five question series, and she is one of the kindest people we’ve ever exchanged emails with. Start with: I loved their episode on productivity and procrastination, and navigating a quarter-life crisis. There’s only 18 episodes total though, so I’d just start from the beginning and binge-listen to all of them if I were you. Cara Alwill Leyba is the author behind the bestselling book, Girl Code. She’s a certified master life coach with a passion for helping women. She’s incredibly real and open about self-care, bad days, and all that relatable jazz. I love listening to her mini-episodes while I get ready for work in the morning. It feels like a personal pep-talk from a best friend who goes through the same stuff that I do. Cara’s advice is always genuine and her podcasts always make me feel lighter. Her podcast is an easy listen as she tends to speak from recent experiences in her life that have taught her valuable life lessons. Start with: These super quick mini-episodes will show you what Cara is all about: how to deal with negative people and what are you available for in your life. If you’re wondering what would be in my personal “New and Noteworthy” section, it would be the Making Bold Moves podcast. Mia Goros recently launched a podcast for heart-centered game changers with a passion for living life on purpose. Her conversations are genuine and inspiring. She interviews successful, interesting people on their journeys to doing what they love and how they took big leaps in their lives. She’s also a friend of mine and it was an honor to be one of her first podcast guests. If you want to hear that episode, you can listen here. You can also enter a rad giveaway with over $400 worth of goodies that Mia is giving away in promotion for her new podcast launch. She’s giving away a Spire mindfulness tracker, essential oil set, and a year of Luminosity to name just a few of the prizes. Giveaway ends Wednesday, 9/26/17. Start with: Learn about who Mia is and her personal journey and this episode on creativity and finding your people is a fun one. Brooke Castillo owns The Life Coach School, a school for becoming a certified life coach, and she shares her knowledge with listeners on how to coach yourself to live to your potential. One of her most popular topics is how to feel better. She starts each podcast off with saying some variation of “How are you guys? I’m amazing!” And I don’t know why, but that always makes me happy. Her energy is contagious. She also has a podcast specifically for becoming a life coach. Start with: Her episode on self-confidence is relatable for everybody. The episode on how to feel better is what she’s all about. Lori Harder, the bubbly host of the Earn Your Happy podcast, is an ex-fitness model/trainer with a passion for self-improvement. She talks about motivation, self-love, and being an entrepreneur. She does interviews and shorter episodes that are about 10 minutes long. Typically I’m drawn to her shorter solo-episodes, because I can listen to them when I just need just a little dose of inspiration. Start with: If you’re looking for a short one, I enjoyed this recent episode on surrendering to success. She’s also interviewed some of my favorite people like Danielle LaPorte on using your failure to reinvent yourself and Gabby Bernstein on making an impact doing what you love. Being Boss is the go-to podcast for creative entrepreneurs. Kathleen Shannon and Emily Thompson know how to put on a good podcast about business. If you like business talk, but you find that most podcasts on the topic are dry and dull, you’ll love this one. I’ve been binge-listening to the Being Boss podcast for several months now, and it is hands down one of my most-listened to podcast recommendations. It’s aimed at entrepreneurs or aspiring entrepreneurs who want to be more boss in their work and in their career as a boss. I don’t really consider myself to be an entrepreneur yet, but I find their content and advice extremely applicable to what I desire to create in the future and am working to build now. Start with: Most of us probably love Brené Brown, and this was a great interview with her. This episode on boss integrity with Jay Pryor was my favorite episode, which is saying a lot because I have yet to find an episode I don’t love. Start with: I loved this episode with Mark Manson on why fear, anxiety, and negativity are necessary and this one on the keys to creating the best relationship of your life with a licensed Marriage and Family therapist. If you’re a regular here, you know we’re all about bringing our lives to the next level. Be Amplified is all about amplifying your life and business and so, naturally we dig it. Bri Seeley and Thaís Sky are all about authentic connection and talking with women who are running successful businesses. They go beyond the business and into the real world with topics like taking big leaps, ending relationships, and even overcoming addiction. But don’t shy away from business topics either. They start with sharing their opinions, and end with a guest interview on the topic. Start with: I loved the episode with just Bri + Thais on having it all and the episode with Natalie MacNeil on ending a relationship. I could just be a nosey person, but I love hearing people get personal about relationships, so I really enjoyed that one. 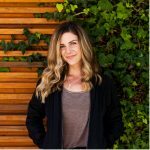 Jordan Younger is the writer behind The Balanced Blonde blog; it’s all about wellness and living a spiritual life. I would say this podcast is perfect for the very open-minded, spiritual woman who isn’t afraid of getting a little woo woo. My favorite episodes from Jordan are the solo podcasts where she goes in-depth into her personal story—the journey behind her blog, spirituality, and past traumatic events. She goes into detail, and you feel like you know her on a personal level through her podcast episodes. Start with: If you’re already familiar with Jordan’s blog, I’d start with the Real Talk Solo Episode on overcoming trauma. It’s one where you feel most connected to Jordan, and will probably relate on some level. If not, I’d start with one of her recent interviews. With her 2.1 million followers on Instagram and my love for yoga, I don’t know how I hadn’t heard of Rachel Brathen aka “Yoga Girl” before this podcast. I discovered her in the New and Noteworthy section in the iTunes podcast section, and instantly was intrigued. A successful yogi talking about her personal life? I’m here for it. And the podcast didn’t disappoint. Rachel is extremely personal and vulnerable, which is rare for someone with millions of followers. I find her voice soothing and her topics always hit me, even if she’s talking about something I know nothing about, like her newborn baby. Start with: The first podcast episode on her daughter’s birth story hooked me in with her openness and great storytelling and it will likely hook you too. But if you’re not into hearing about parenting or giving birth (I totally feel you), I also loved her episode on vulnerability and on hard lessons learned and the business of yoga. Comment below with your favorite podcasts of the moment. We’re dying to know your recommendations, as we’re obviously podcast-obsessed!